Who says wedding photography can't be fun? 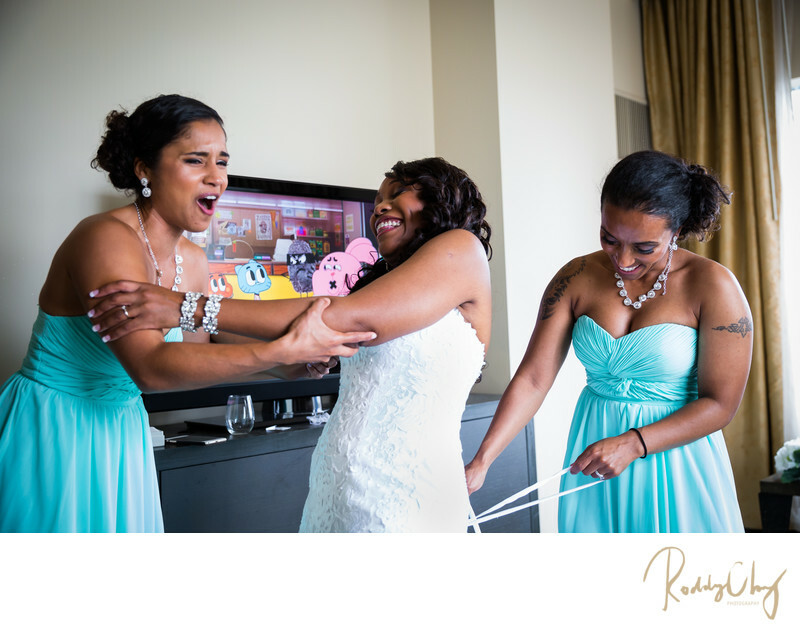 Erika and her bridesmaids started getting ready at 6am at Hyatt Olive 8 in downtown Seattle. When the groom Mark told her he would not marry her if she gets to the ceremony late, she took a mental note and made sure she'd get to the destination in the most timely manner. However, as a wedding photographer who has been to more than a handful of weddings every year, I'd warn - don't ever expect everything to be planned perfectly. It was a chaotic morning at the presidential suite of Olive 8 Hotel. Erika and her bridesmaids got all of their dresses tailored a couple months prior to the wedding. When on the day of, quite a few people including her and her sister had a rough time putting themselves into the dress! As a result, they spent an extra hour trying to help each other strap up. This is a candid shot taken while they were severely struggling with the dress. I'm pretty sure Erika told me she could barely breath in that dress for the rest of the day. Oh what moment. You picture your dream wedding for your whole life, but it was moment like this that would make your wedding a cherry on top, and through this you learn to cherish the friendship you have with the people present to help make your wedding come true. Well, they did get to the ceremony late, but Mark still decided to marry Erika eventually! Location: 1635 8th Ave, Seattle, WA 98101.